Friarielli is a bitter green grown extensively in Campania. 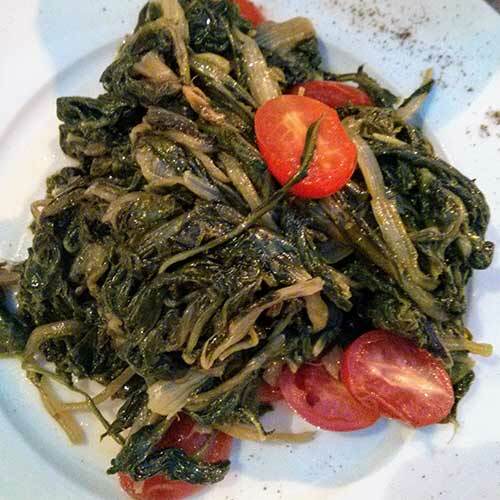 It is related to the rapini of Tuscany and cima di rapa of Puglia, but an Italian would tell you they aren’t the same. As a contorno, friarelli are usually served sauteed in olive oil and garlic with a small scatter of hot pepper flakes. The one in the picture livens up the color with a few cherry tomatoes. This is a vegetable that begs for sausage. Not the kind of sausage you find in the US that uses every herb and filler in the known universe, but the kind you find in an Italian meat market with an ingredient list as simple as sausage: ground pork, salt, pepper. The ones in the next market will go them one “better” on the simple scale. “Non si usa pepe! the signs will declare. Less is more in real Italian cooking. So you’re likely to see friarielli and sausage pizza or pasta with friarielli and sausage in the south.